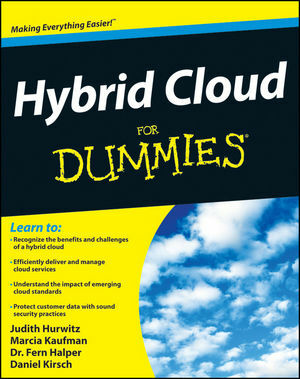 Hybrid clouds are transforming the way that organizations do business. This handy guide helps you find out what this new cloud deployment model is all about. You'll get down- to-earth information about cloud technology, questions to consider, and how to plan and deliver your move to a hybrid environment. Judith Hurwitz is President and CEO of Hurwitz & Associates, specializing in cloud computing, service management, information management, and business strategy. Marcia Kaufman is COO and partner of Hurwitz & Associates, focusing on the cloud infrastructure, information management, and service management. Dr. Fern Halper is a partner at Hurwitz & Associates with extensive expertise in information management, big data, and analytics. Daniel Kirsch is an analyst at Hurwitz & Associates, focusing on cloud compliance, governance, security, and privacy.